Quietly step into an ancient Byzantine building and you will be struck by the magnificent stained glass windows. The Byzantine artists created beautiful works of art. They often created intricate mosaics floors and stained glass. Their work still astounds artists, worshipers and tourists today. 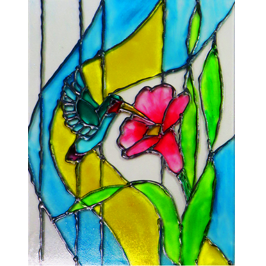 In this project Sharon will teach students how to create a faux stained glass masterpiece. This project is a Level 2 in difficulty.